Scene: A Saturday night. Outside a suburban home alongside a second suburban homes. The time is 11.44pm. A large group of 19 year olds are sitting outside the first home wearing party clothes and the front porch light is on. In the second house, a mother and father have been trying to settle their six month old baby for 30 minutes. 19 year old man #1: Let’s just go to Francesca’s. Mother: [to baby] Shhhhh. Shhhhh. Shhh. 19 year old man #1: [walks part way down the street, runs back] Lets just go to Francescas. 19 year old man #2: Wait, I think I left my shoes inside. 19 year old woman #2: [walks out, notices people, speaks loudly] Are we going to Francescas? 19 year old man #3: Do we need a taxi? 19 year old man #2: Maybe. Ive just got to get my shoes. 19 year old man #1: Can we just go to Francescas? 19 year old woman #2: Wheres Blake? 19 year old man #2: I think hes inside. Ill look for him. Ive got to get my shoes anyway. What does he look like? 19 year old woman #1: I think he went home. 19 year old man #3: Maybe we need two taxis. How many of us are there? 19 year old man #4: Five. 19 year old man #5: I think its more like eight. The others are coming too. 19 year old man #6: Nine, then. I think its nine. 19 year old man #2: [returns from inside] I couldnt find my shoes. Has anyone seen my shoes? 19 year old woman #1: I think I saw them in the bathroom. 19 year old woman #2: Did you see Blake? 19 year old woman #3: [emerges from inside] Are you guys going to Francescas? 19 year old man #1: Well, Im going to Francescas. Mother: [internal dialogue perhaps in some small way, we are all just going to Francescas.] Shhhh, shhhh, shhh. 19 year old man #4: I dont know Francesca very well. 19 year old woman #1: [flicking hair back]It’s a bar. It’s not a person. 19 year old man #3: I think we do need two taxis. 19 year old man #2: [runs up the street, runs back] Heeeyyyyyyyyy! Mother: [internal dialogue Who is Francesca? Is Francesca a metaphor? 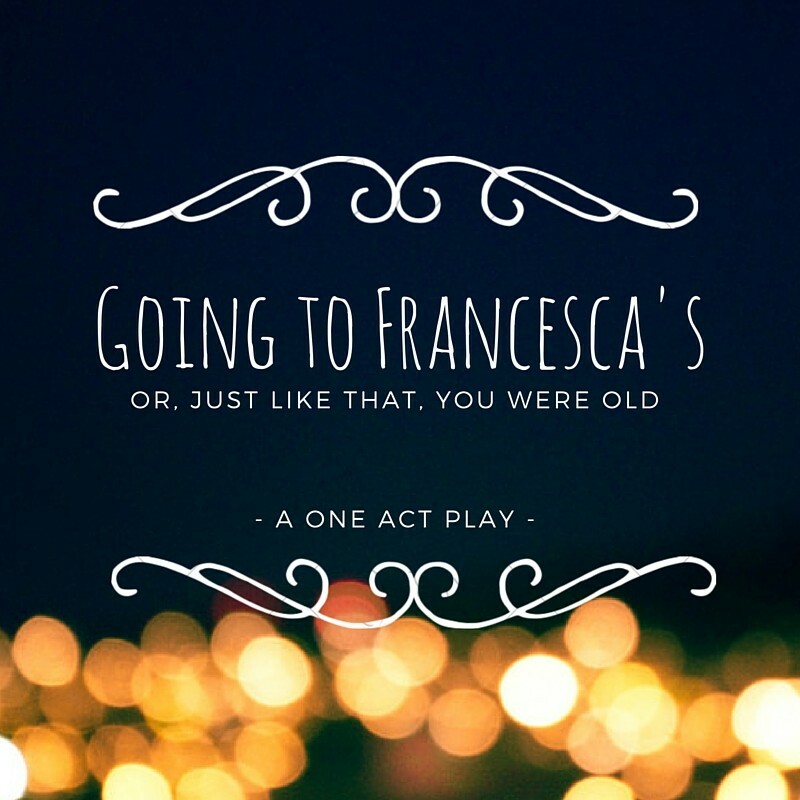 Francesca is not a real person; she is a destination; she is a journey.] Shhhh, shhhh, shhh. 19 year old man #5: Guys, do you think I should watch Breaking Bad? 19 year old woman #2: Seriously, wheres Blake? 19 year old woman #1: [seemingly unrelated] Of course she did, shes totally that kind of person. 19 year old woman #4: Is Francesca that girl? 19 year old woman #2: Which girl? 19 year old woman #4: You know. 19 year old woman #1: [flicking hair back] yeah. 19 year old woman #2: We cant go without him. Just wait til I come back with him. Ill just be a minute. 19 year old man #1: Im going. 19 year old man #4: We have to wait for Blake. 19 year old woman #1: I said, I think he went home. 19 year old man #3: Do you think the trains are still running? 19 year old woman #4: I heard they were going to stop them at 11. 19 year old man #3: No way. 19 year old woman #4: Thats just what I heard. 19 year old man #5: So, should I watch Breaking Bad? 19 year old man #6: Does anyone have a charger? 19 year old man #4: Were still waiting for Blake. 19 year old woman #2: Typical Blake. Blake: Im here! I was just helping a guy look for his shoes. 19 year old woman #2: Blake! 19 year old man #4: Did you find them? 19 year old man #4: The shoes. 19 year old man #4: Did you find the shoes? Blake: Yeah, right. We were looking in the bathroom. 19 year old woman #2: There are two bathrooms. Which one were you looking in? 19 year old woman #1: It was the other bathroom. 19 year old man #5: I think I will, then. Yeah. 19 year old man #5: Watch Breaking Bad. 19 year old man #1: Guys, lets just go to Francescas. 19 year old woman #2: I hope Ava is going. But I hope Will isnt. Mother: [internal dialogue We are all Francesca. We are all also going to Francescas. Francesca is us but also not us.] Shhhh, shhhh, shhh. 19 year old man #1: Did you hear me? I said, lets just go to Francescas. Father: [loud whisper] What are you doing? Mother: [loud whisper] I was just going to ask them to move on. Father: [loud whisper] What time is it? Father: [loud whisper] We cant complain; its only 12 oclock on a Saturday! Father: [loud whisper] Why dont I go in and settle him and you can stand out here in the hall fuming for a while and listening. Mother: Thanks. I think I will. 19 year old woman #3: Has anyone considered the opportunity cost of going to Francescas? 19 year old man #8: [loudly, emerging from house] Guys, guys, guys hiiiii! Im going to Francescas. Anyone else want to come? 19 year old man #3: [loudly] I think we can walk from here, actually. 19 year old man #2: [very loudly] I found my shoes! 19 year old man #1: Lets just go. Lets go to Francescas. Father: [to baby, for another 20 minutes] Shhh, shhhhh, shhhhh. Gold. Small but perfectly formed.